Dr Michael Maguire has been confirmed as Northern Ireland's new Police Ombudsman. Al Hutchinson stepped down from the role in January after criticism of the performance of his office, which handles complaints about the police. Dr Maguire is currently the Chief Inspector of Criminal Justice in Northern Ireland. 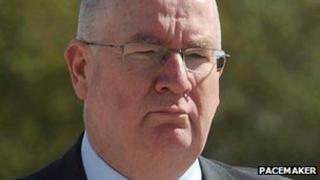 Mr Hutchinson became the second police ombudsman for Northern Ireland when he succeeded Nuala O'Loan in 2007. In 2011, three independent reports were highly critical of the work being carried out by the ombudsman's office. As Criminal Justice Inspector, Dr Michael Maguire published a report last year that was highly critical of how the Office of the Police Ombudsman carried out its work. His report said the former Ombudsman, Al Hutchinson, had lost the confidence of senior members of his staff. It also said a number of reports produced by the office had been re-written to reduce criticism of the police, and that investigations into historical events should be suspended. Having spent months identifying the problems within the office, Dr Maguire is now being asked to deliver the changes he said were necessary. One of these by Criminal Justice Inspection found that the independence of the office had been compromised. After the report's publication last September, Mr Hutchinson announced he would be stepping down earlier than planned. Last month, Justice Minister David Ford began a public consultation on reforms to the Police Ombudsman's Office, covering proposed changes to its structure, role and powers. Mr Ford said the consultation outlined the potential for "significant changes" to the office's law and governance. Dr Maguire has worked at Criminal Justice Inspection since 2008. Before that, he was a partner in a consulting firm, and he has been involved in strategic and organisational reviews across the public sector. He was chairman of the Institute of Directors in Northern Ireland between 2004 and 2006. DUP Policing Board member Jonathan Craig said: "It is important this ombudsman respects the work of the RUC and recognises the very difficult circumstances in which those officers worked. "Indeed, it would be the DUP's view that the ombudsman should concentrate on overseeing, where necessary, the PSNI and let the Historical Enquiries Team deal with the events of the past." Sinn Fein Policing Board member Gerry Kelly said he wished Dr Maguire well "in what will be undoubtedly be a difficult and challenging endeavour". "What Sinn Fein expect from a new ombudsman is to return the credibility and reputation to this important office," he said. SDLP Policing Board member Conall McDevitt said: "He has considerable challenges ahead of him, the biggest of which will be restoring public confidence in his office and establishing credibility, especially around legacy cases." Ulster Unionist Policing Board member Ross Hussey said: "Dr Maguire brings a wealth of experience to his new post, and I wish him well in his efforts to restore public confidence in the ombudsman's office following the criticism which has been directed at it in recent times."